Any mom will tell you that the worst part of Halloween is all the left over candy just hanging around in your house. It not only calls to your children, but it also calls to us... "M&Ms are over here" "Almond Joy, anyone?" "Excuse me, but have you met Mike and Ike?" If you are like me, you can't wait for the day when you can just toss it in the garbage and no one will notice. Actually, on second thought, that is a bit wasteful... so why not do what the mom in this article did and do some candy experiments with your kids? You not only can encourage their curiosity, but also get rid of the evil temptation of Halloween candy. 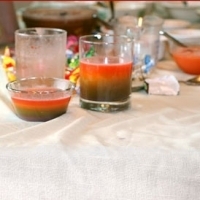 The experiments she discusses are primarily for older kids (like testing for acid in sour candy and doing chromatography), but younger children will love her ideas for mixing colors and melting candy in the microwave.